When I told my husband that I needed a compact, folding if possible cart or wheelbarrow, he said I was asking for the moon and was doubtful that he'd find one. Well sure enough he found this one and I was thrilled! 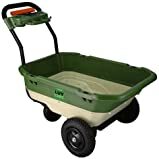 I'm a professional gardener and when the cart arrived, the assembly was so simple that I was off and loading it up right away. All my tools fit, it was very light weight and it fit very compactly in the back of my Jeep Cherokee. 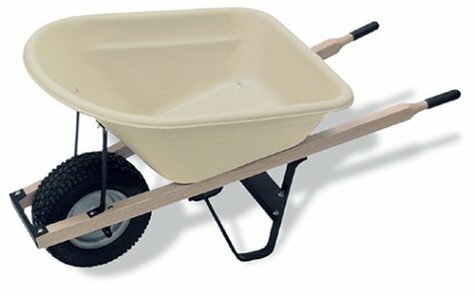 The real test came when I loaded it up with mulch to see how it would work as a wheelbarrow. It was teriffic!! I could fit more in it than the wheelbarrow I was using, and it was easier to fill. Because it has 2 wheels instead of 1, it wouldn't tip over when filled to the brim! Unloading it was easy too, I just took the back off and dumped the mulch where I needed it. The channels for that back panel do get a bit plugged up with mulch after a hard day of work, but clean up easy enough. 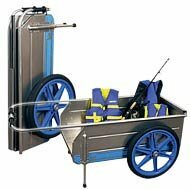 This cart is totally awesome....this is the best tool investment I made last year! Thanks for a wonderful product!! 1. The tires are flimsy. Get good tubes (if the tires come without them) and get a plastic strip thorn-proofer from a bike shop. It will help. Might as well get a can of flat tire spray, too, if you're going to pull it over anything rough or thorny (like berry prunings). 2. 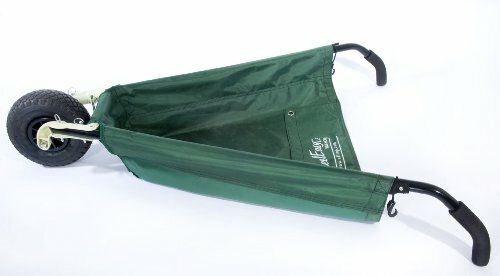 The design has a serious weak point: the rolled sides of the cart (where the handles slide in) will split at the handle-locking rivets if you habitually carry much weight (say 50 lb or so) over rough ground. This is very hard to fix and the split widens until there's a big tear and the handles fall out --permanently. That's what finally did in carts one and two. This time I'm going to try to reinforce the area around the rivets immediately, before they have a chance to start a split. Fold-it seems to outlast expensive wood carts by years despite this flaw. 3. Plan to pull the cart. 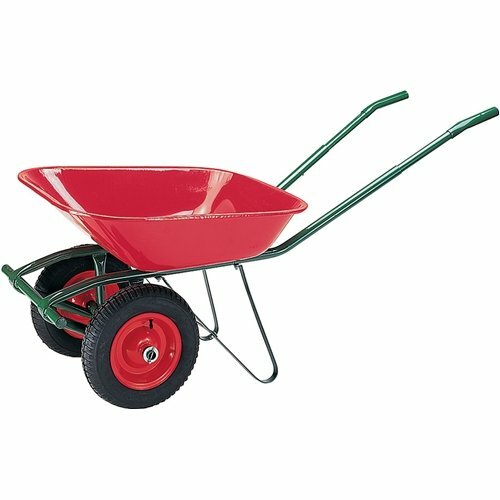 Pushing as you would a wheelbarrow is hopeless. (A Fold-it is not necessarily a wheelbarrow substitute.) It's handier and better balanced by far than any deep plastic or wood cart I've tried, but it's not good at moving manure or heavy loads into the garden --the tires are narrow and sink into worked soil, and it's not made for turning in place or flipping upside down as you would a wheelbarrow. You can push it down a row empty and pull it out with a light load of weeds or produce, though. 4. You get to balance the load yourself. This is good. Some carts get heavier and pull harder as you load them. 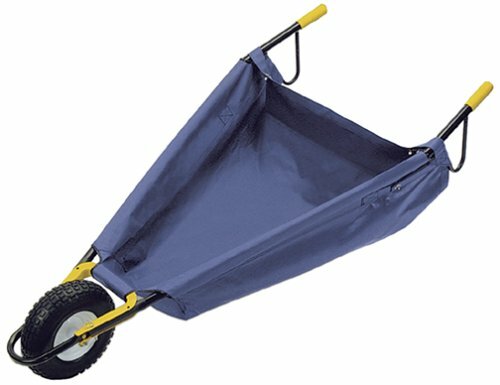 Balance the load in a Fold-it so there's weight behind the wheels and you can pull it with one finger, on hard ground. 5. The bed is a convenient height, great for taking to the orchard to bring back with heavy baskets of fruit, to the clothesline with heavy baskets of clothes, from car to kitchen door with mega-loads of groceries. Easy to load because the bed is flat and rectangular, and you don't have to lift heavy dog food bags (for instance) over the sides. You can slide them out the back with the gate off. 6. If you use the Fold-it for hauling hay, compost or weeds, expect to spend some time cleaning the fold lines if you ever need to fold it. Plan ahead if you're taking it to a horse show! much as a boat supposedly can be carried by a ship. (because moving parts are prone to breakdown and mismatch). look at the B00011SPU0 (highlight/copy/paste this into "Search"). of an ocean-front location would ROT the aluminum. ROT, not rust. gone to the Road Warrior graveyard. electricity (uranium or fossil fuel) to manufacture. The other star is gone because I'd rather hand it to B00011SPU0. withOUT the 3M tape (preferably canary yellow or zebra-striped). of the adhesive is stronger than when compromised by water/grit. "engraving tool" (loaner unit) from your friendly peace officer. Hope this review was helpful. Comments welcome to my web address. 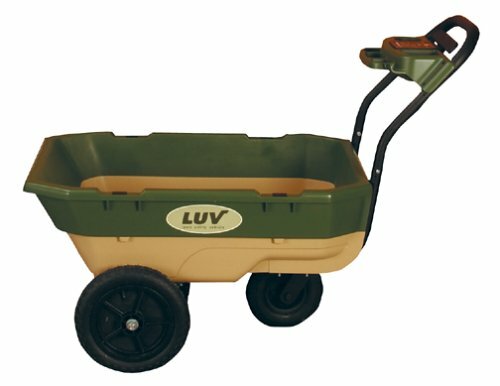 I bought one of these carts about 6 years ago. I am an artist who participates in art and craft shows so I use it to haul my display, canopy and products. It has held up perfectly over the years. It's been the best cart I could have purchased. It folds up small enough to fit in the back of my Toyota Tercel hatchback with plenty of room for everything else. It hasn't rusted or dented. I barely even have to oil the 2 hinged elements (I think I've done that once or twice since purchase). I've loaded it up with sand bags and heavy umberella stands and it takes a lot of weight. All I do is add air to the tires about twice a year. I use it every weekend so it's seen a lot of use. I've had lots of other crafts people ask me where I got it. They all recognize how much better it is than a dolly that requires straps or bungee cords to secure everything in. This is a great price for it... I almost feel like getting another one, but mine is still fine so I don't need it. I have been using and abusing this cart since I got it from Amazon. It is highly maneuverable and, with a quick change of the pins, is storable in a small space. It doesn't hold as much as I'd like in terms of volume. The flaps on the straps come undone pretty easily. And it is hard to upend the cart as you would a wheelbarrow to empty the contents. And when you do upend the cart, not everything falls out. It is strong and light. 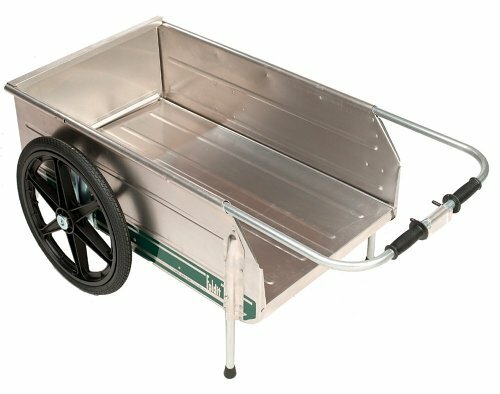 All in all, I recommend the cart for light to medium gardening. handles were dirty and one of them was ripped. Don't know if that was from shipping. There were no directions enclosed. After spending 45 minutes to get it together I gave up. I was very surprised that you would have to change the pins when you store and then again when you use. Think that would be very difficult as time goes on and you use the product.As a woman, I would have problems changing the pins. Great design! Easy to load, unload and maneuver. Easy to clean and store. A must for gardeners with limited storage space. Two-wheel design for ease of movement and added stability. How long does it take (24hrs) my foot !!!!! 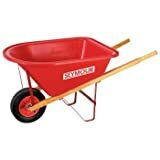 I ordered my wheelbarrow 3 weeks ago !!! !Where is it. I ordered on March the 5th. I ordered mine almost 9 weeks ago and have no straight answer from customer service yet. I didn't have any problem with the assembly of this very strong and stable wheelbarrow.It probably helps that I have pretty good mechchanical ability.It did not say in the instructions, but I recommend putting some grease on the axel.It is well worth the price, and should give me many many years of service. I agree with a previous reviewer that the assembly instructions are not step-by-step or geared for the average gardener. 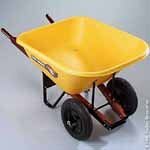 If you do not have a good mechanical aptitude, it is still well worth buying this sturdy wheelbarrow and having a wrenchhead friend assist for a half hour or so. The instructions are written for a one-wheel version, so double wheelers have to wing the last few steps. All parts are furnished for BOTH models, strangely, but it only fits together one way and you end up with some hardware for your junk box! 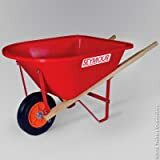 Much better than the expensive plastic hopper barrows I was finding at the discount home stores, and should last many seasons. Manufacturer: CLARKE POWER PRODUCTS, INC.
Bearings: 5/8" Shielded Ball Bearings. 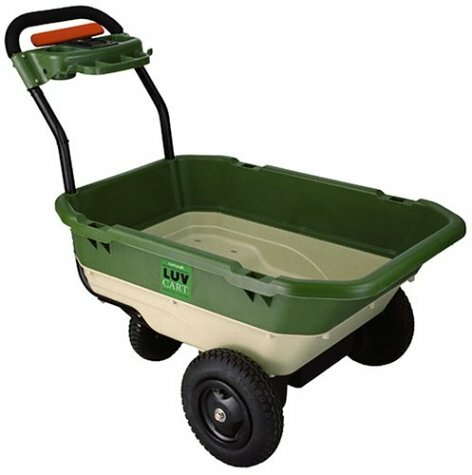 Perfect for Hand Trucks, Air Compressors, Garden Carts, and more! This tire is made up of millions of tiny air pockets providing the tire with bounce and load handling characteristics similar to an air-filled tire - with the benefit of never going flat. POLYURETHANE - the material used to produce the world's greatest tire will not break down from sun and the environment like rubber. This unique formulation creates a tough outer skin making the tire resistant to abrasion and chemicals. 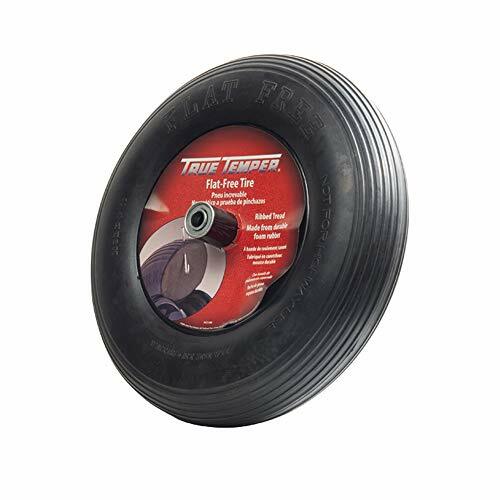 The tires come mounted on a heavy-duty steel rims with 5/8" shielded ball bearings. Two year guarantee that each tire is free from manufacturer defects. Capacity exceeds 300 pounds per tire. I finally got replacement parts (2 sets, actually!) and still had to buy some hardware so the wheels would not flop around on the axle. Also, the handles are not straight and kind of "wobble"--but the thing works and compared to sturdier models for 3-4 times the price, it's okay. Wrong parts and no instructions! I've had this for almost a year, and don't know what I did without it. It takes almost no effort to pull big loads, turns on a dime, and is easy to dump. Very well made, and assembles very easily. I assembled it myself in about 1/2 hour. Very handy around the ranch! I use it daily! I clean the stalls with it and it's very easy to dump the manure out. It cleans up real well because I also use it to take the hay to the horses. I would rather use the wagon then the pick up truck! My husband has used it around the yard when he trims the trees and can't believe how easy it is to pull. 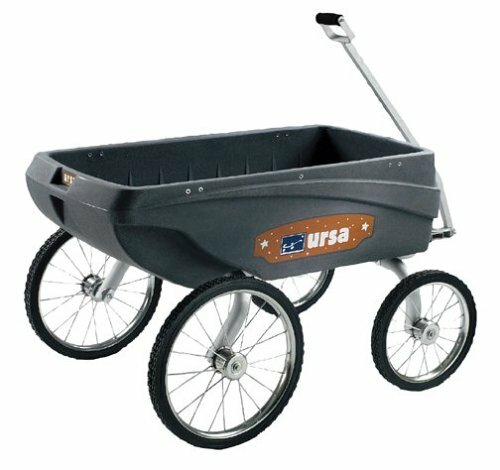 I can't say enough about the Ursa Wagon. I love it!